After returning from the day trip to the Crane Overlook site on April 17, we received satellite images that completely changed our plan. The images from both a NASA and a Canadian satellite showed that persistent westerly winds starting in early April had opened a large gap in the sea ice just to the east of the Larsen A, B, and C—a long highway of dark water that we could use to get to areas we have been trying to reach for four years. 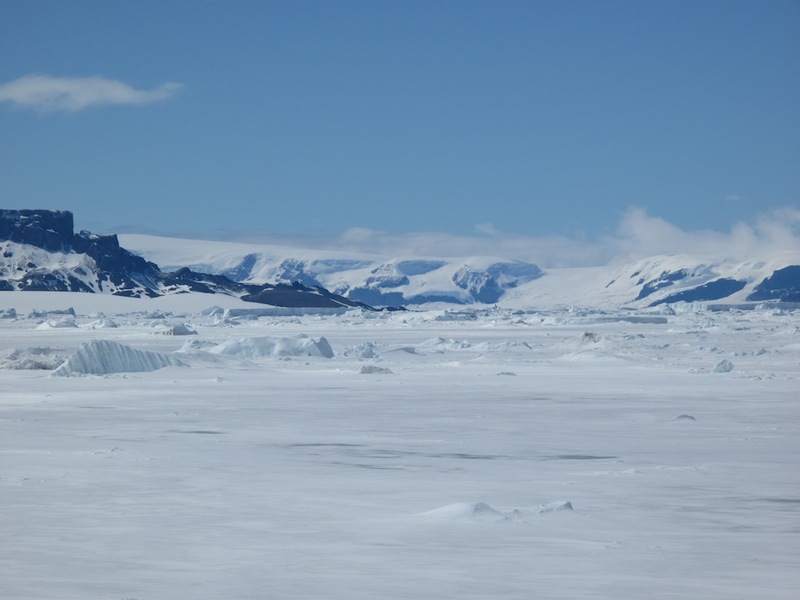 But the opened road on the eastern Peninsula came with a significant risk: at this point in the Antarctic season, such a path could freeze over or slam shut in a matter of days, making it difficult even for a powerful icebreaker like the Araon to escape. The KOPRI (Korean Polar Research Institute) scientists were willing to take the risk, in part because the ship is fairly fast, capable of up to 14 knots, and because the science potential was high. The weather is much drier on the leeward eastern side of the Antarctic Peninsula, so we would be likely to fly more often. 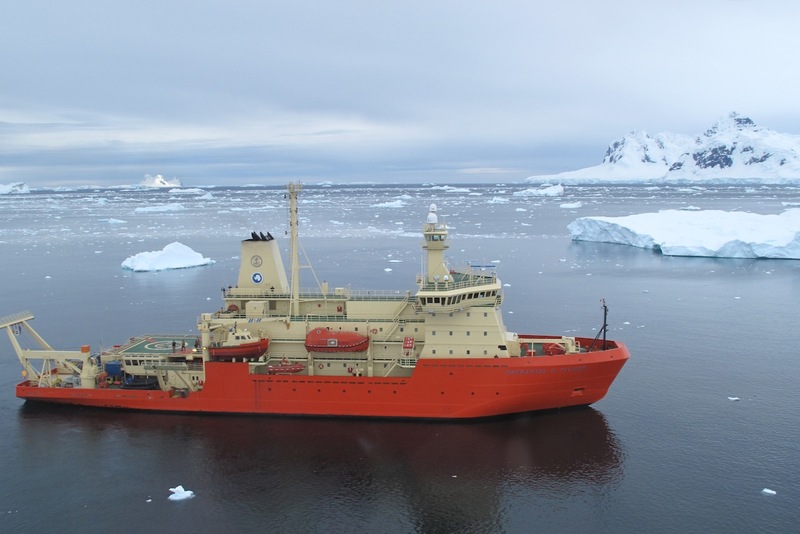 Communications and weather safety are better because one can see conditions approaching the ship or the field site from a long distance (without the blocking of the high Antarctic Peninsula ridge). That evening, we took the ship as fast as possible over the northern tip of the Peninsula to the eastern side and sailed down into the gap less than two days later. The flock toboggans away from the sound of the passing ship. And there we were: at the fast ice edge of the Larsen B Ice Shelf, ready to fly with helicopters to the three major glaciers of our study area, one of them already fast-moving and thinning as a result of global warming (Crane Glacier), and two others (Flask and Leppard glaciers) that were poised to change if the last remnant of the Larsen B, the Scar Inlet Ice Shelf, collapsed. The next day (April 20) was clear and warm. The forecast suggested a gradual shift to cooler southern winds by late in the day. We loaded the helos according to a complex plan, trying to get as much done as possible. We would identify a second rock outcrop and install a seismic monitoring station, and begin work on a multi-instrument AMIGOS site on a small crevasse-free section of lower Leppard just a few miles away from the seismic site. The flight to Leppard was spectacular and revealing. The remnant Scar Inlet shelf from the once-vast Larsen B is now completely fragmented, as cracked as a windshield after an accident, with huge deep rifts indicating fractures on the underside of the floating ice as well. It is clear that the next warm summer will be the last one for this shelf. We were eager to get to our site and get going. But there were problems. Our search on the mountain next to Leppard Glacier for a good seismic mounting site was hampered by bumpy winds around the peaks. Lower down, the rock sites were covered in gravel and loose talus, and were not suitable. So we decided to put the seismic station on the glacier at the AMIGOS site. Problems with the Iridium satellite phones arose. 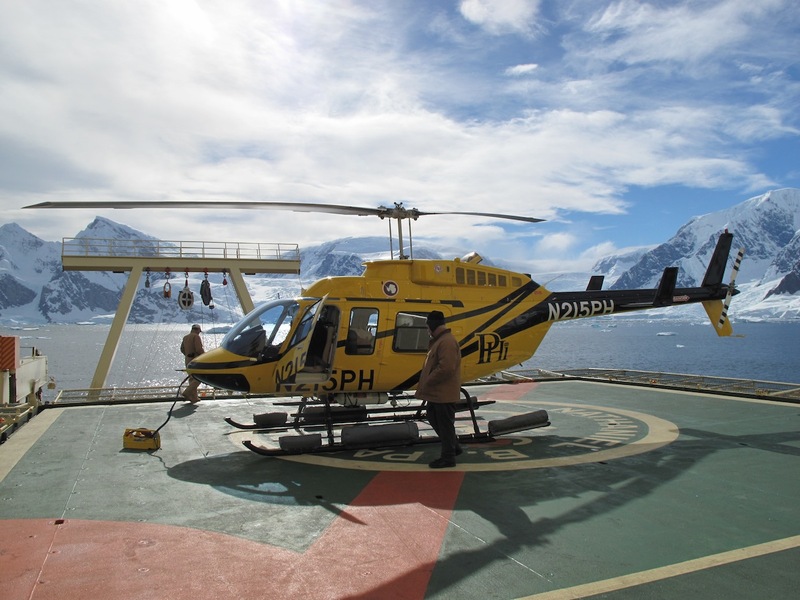 We could not contact the ship, except using the helicopter radios, and they had to be aloft to make a clear call. 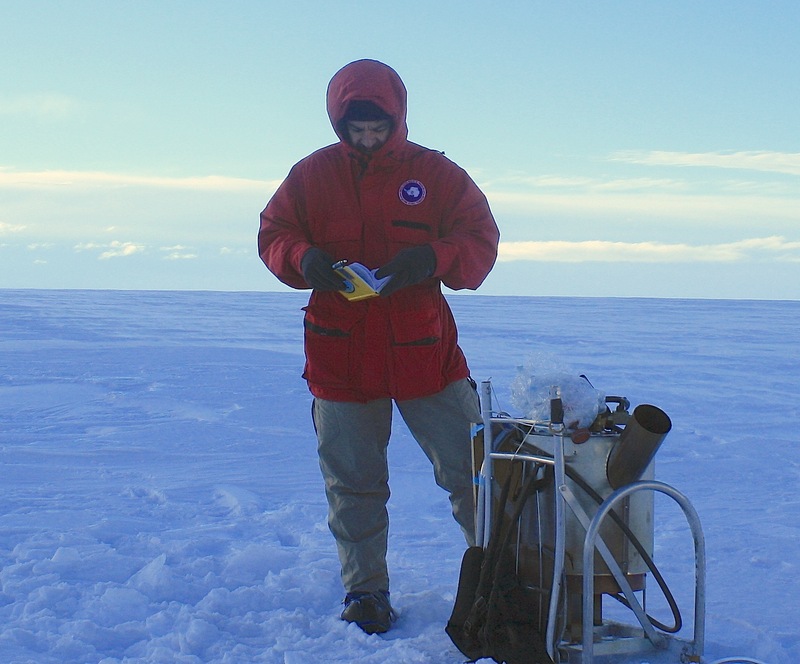 Ted Scambos records some notes on Leppard Glacier. The field instrument next to Ted is a backpack-mounted, gas-powered steam drill. Slowly things moved along despite these obstacles. We conducted a radar survey, skiing a few km across the glacier. The seismic crew began to build the station. A Korean geologist and I returned to the ship in early afternoon. On the flight back, I noticed low fog forming over the Scar, a very ominous sign. Fog had trapped a group of us for over a week in 2010, and that was in summery January, not April. When we landed I asked the pilots to hurry back and get the rest of the crew right away. But after the helos left, we realized that fog was only the beginning of the weather change. 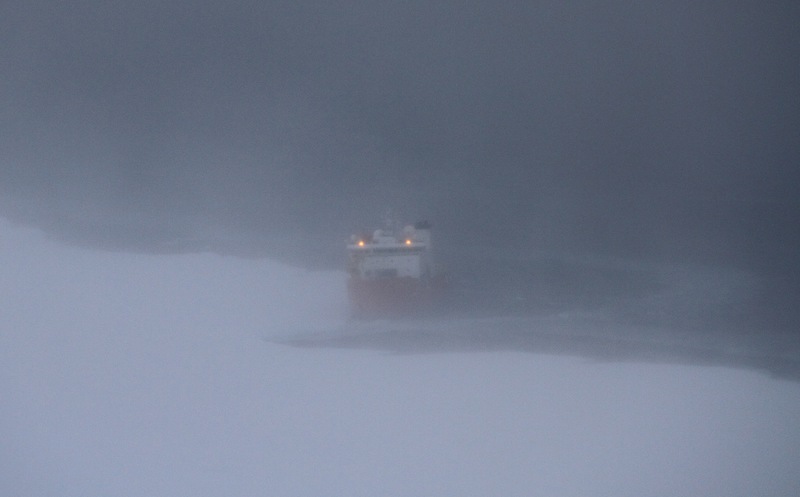 Far from being a gradual wind shift, a sudden abrupt blast of south wind hit the ship, and within minutes we were engulfed in cold blowing snow and mist. Temperatures plummeted. Our sunny day was going to end with a powerful snow squall, with seven scientists still at the Leppard site. Conditions remained beautiful there, 70 miles away. We radioed the pilots and told them about the declining conditions at the ship, and they loaded the passengers and headed back. By the time they arrived at the ship, a gale of 40 knots was blowing, and visibility was only a mile or so. The pilots made two amazing landings in the blustery winds, with all passengers and gear safely returned. By nightfall, winds had risen to 60 knots out of the south, with temperatures near zero degrees Fahrenheit. The scientists and ships crew realized that these were exactly the worst conditions for keeping the narrow lane of ocean clear of ice. Cold winds would freeze the open water, and the pack to the east of us (full of thick older ice) would start to shift westward and close us in. The Araon put on all speed and glided through the gathering slushy ice, a gale at its back, until we were north of Robertson Island (the most likely ‘pinch point’ for the drifting ice to close us in). We were not done though—as the first gale subsided the next day, we returned south again, finding that the road was narrow but not completely shut. 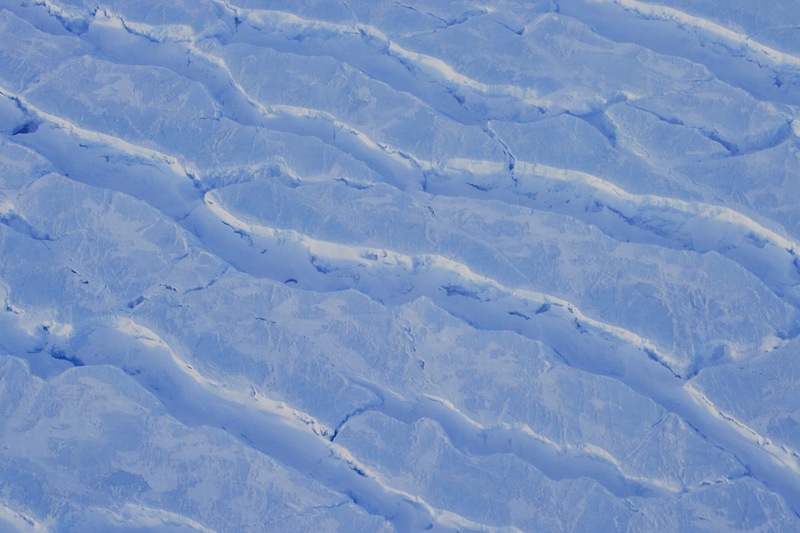 We traveled past the Larsen B into the Larsen C, almost touching the Antarctic Circle (in late April!) and collected a core from a key site of the Larsen C. On our way north again, we launched a quick mission to recover gear that had to be left behind when the squall hit. 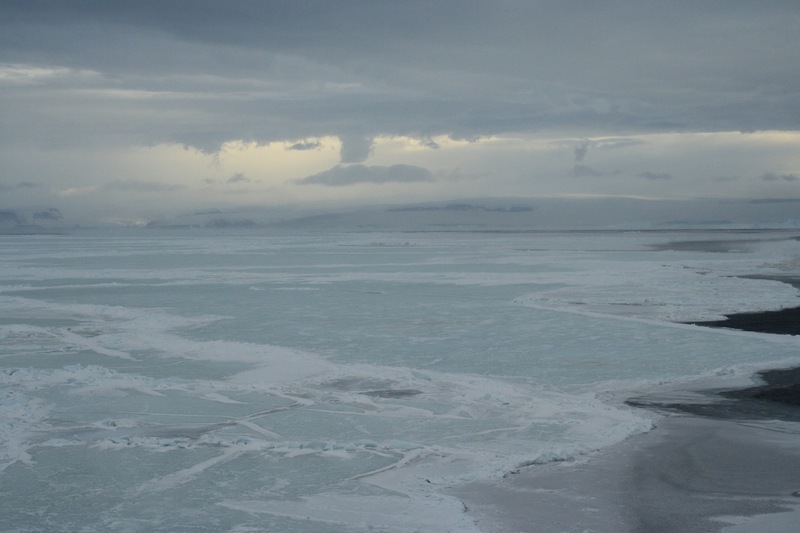 Then we left for good, as the oncoming Antarctic winter was rapidly freezing the sea around us. 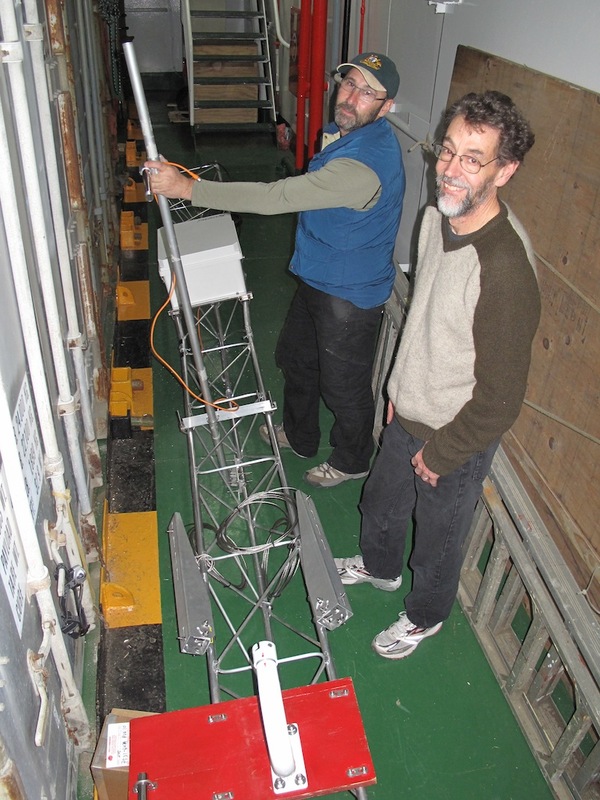 We now are again on the west side, in a fjord called Flandres Bay, just opposite our main instrument sites, with one more week to get some stations installed. Tomorrow looks like flyable weather. 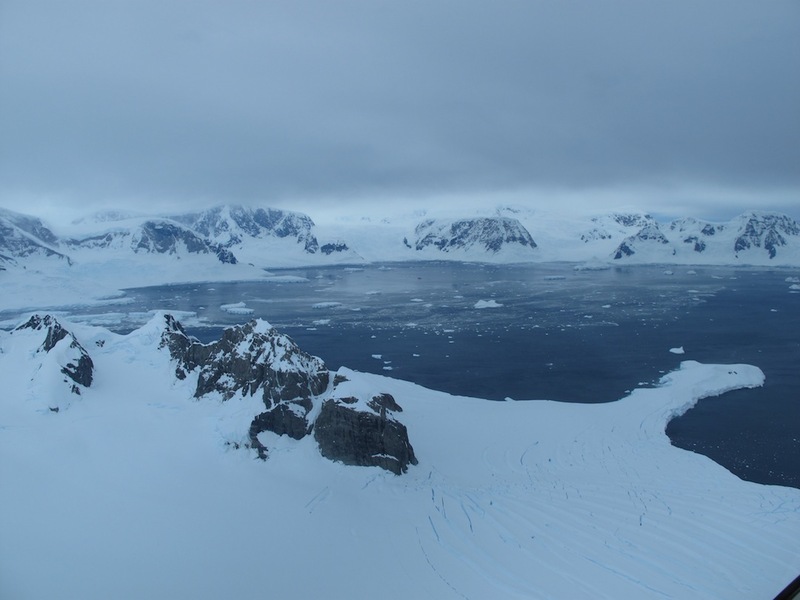 The group took a tour of the island that Rothera lies on, which is rich with polar marine wildlife. 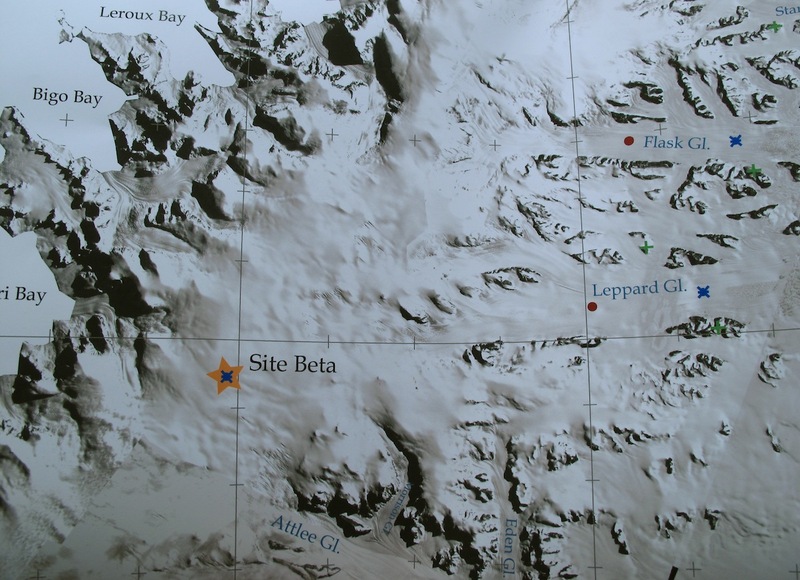 As we described in December, Rothera is a medium-large base with generally about a hundred people there. The key is that it has both a good gravel runway and a pier for ships, making it a logistical hub for the region. Our science liason with BAS, Tamsin Gray, offered to lead us on the trail to the north, along the rock and pebble beach there. It was a living nature park; penguins, sea birds, and several kinds of seals. 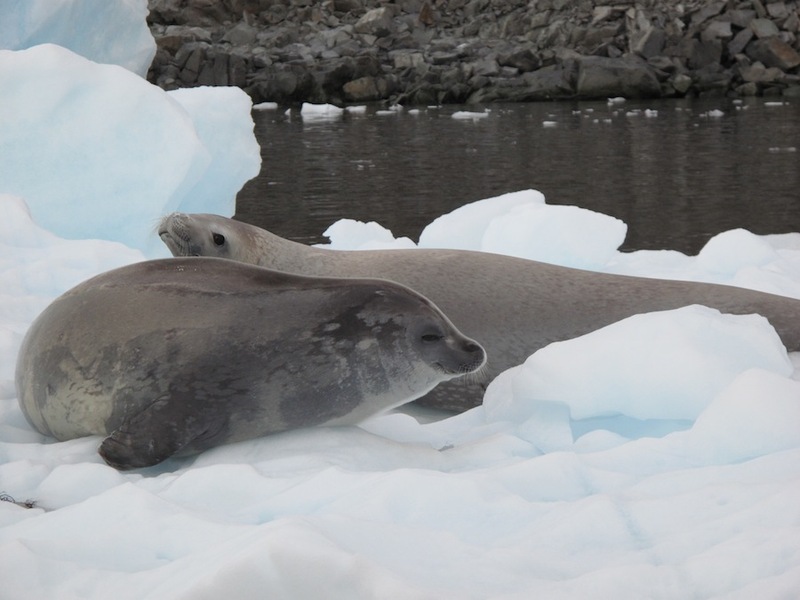 Adelies like to dance, Tamsin explained, fur seals are grouchy, and Weddell and Crabeater seals seem to be smug and puppy-like. The ship, the N.B. Palmer was on its way to Rothera, to drop off our gear after our pull-out from the ice core camp, fuel up, and drop off Martin Truffer, the missing member of the ice team. Our plan for deploying the AMIGOS and other sensors will be done by more Twin Otter flights, allowing the ship to move to the east side and spend much of that time working southward toward the Larsen B, where were supposed to have been all along. It’s been quite a trip so far. By noon, we could see the ship in the distance, and by 1:30 it was approaching the quay at Rothera, with most of its crew and staff standing on the deck waving. We held a planning meeting for the science, and a planning meeting for the Rotherites and Palmerainians. The idea was to give Palmer a taste of shore life, especially a taste at the tiny pub in Rothera’s main building. It was very successful. Erin’s bike was on the ship, so she went for an evening bike ride before saying goodbye to it for a while. The Palmer departed at midnight with a happy glow surrounding it. The N.B. 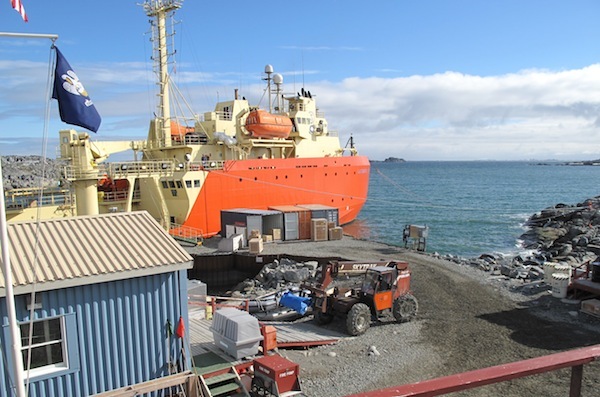 Palmer arrives at Rothera. Photo courtesy Erin Pettit. 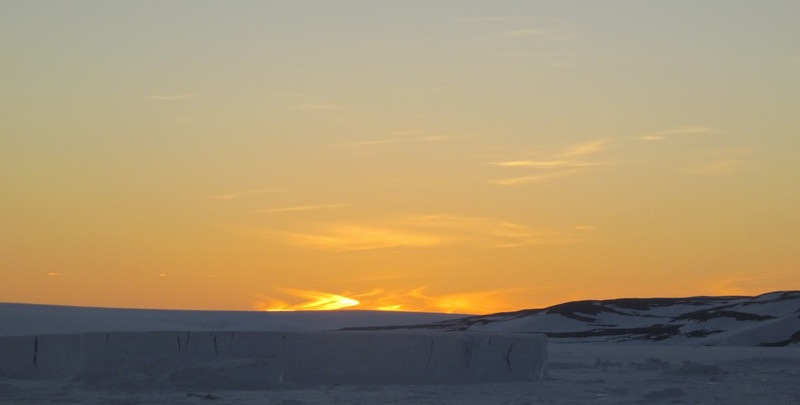 The midnight sun shines over Rothera Station in Antarctica. Photo courtesy Ted Scambos. A fur seal blends into the rocks. Photo courtesy Ted Scambos. Erin takes her bike for a last spin before sending it away on the N.B. Palmer. Photo courtesy Erin Pettit. 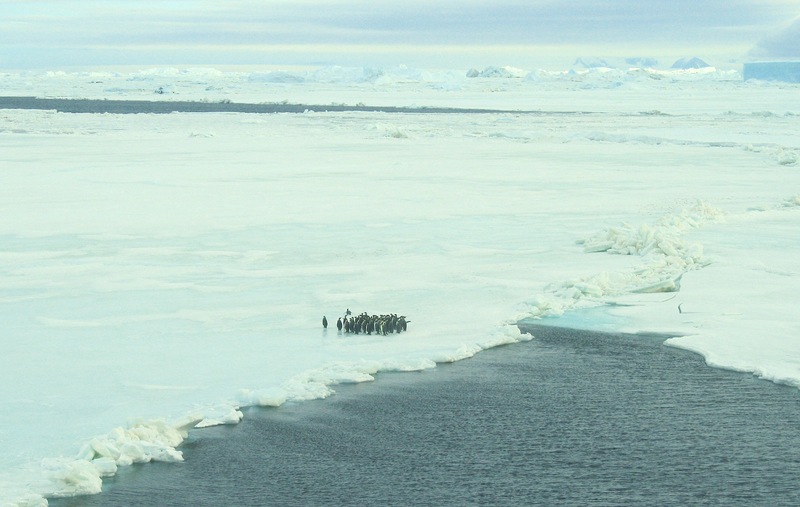 The team saw Adelie penguins, among other animals, on a trail north of the station. Photo courtesy Ted Scambos. This crabeater seal appears to have a smile on its face. Image courtesy Erin Pettit. Rothera Station is a medium large base with usually about 100 people. Image courtesy Ted Scambos. The Palmerites and Rotherians hold a planning meeting. Image courtesy Ted Scambos. This map shows the location of Ted and Martin's goal near Barilari Bay. The LARISSA glaciology team flew again today. This time Martin Truffer and I looked at the possibility of a flight up over the ridge of the Peninsula to our target sites on the east side. Bad weather (clouds, and blowing snow at low levels) has hampered our attempts to get to any of the regions near the Larsen B embayment. 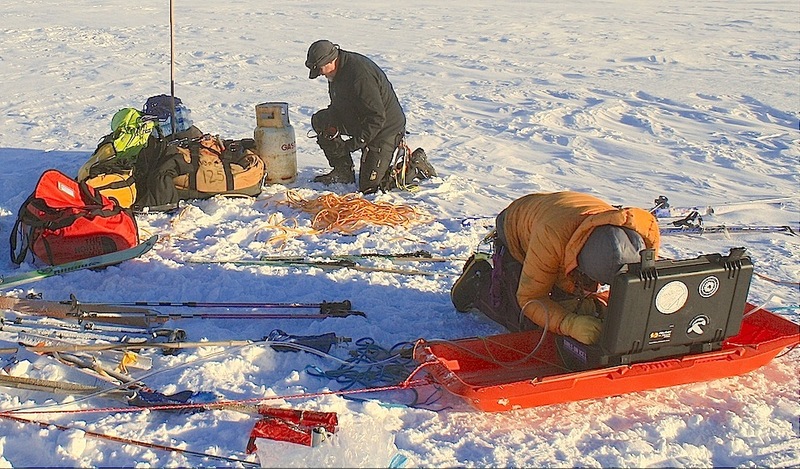 The Palmer has moved south, to a fjord called Barilari Bay, just across from the Site Beta ice core drilling location, which the LARISSA glaciology team surveyed in December. This is a very scenic area, even prettier to my eye because the bay is smaller and ringed by glaciers that flow down right into the water. It is clear that this area had a small ice shelf itself at some time in the fairly recent past, perhaps a few centuries ago. Our marine geology group will look into that possibility while we wait for good weather. 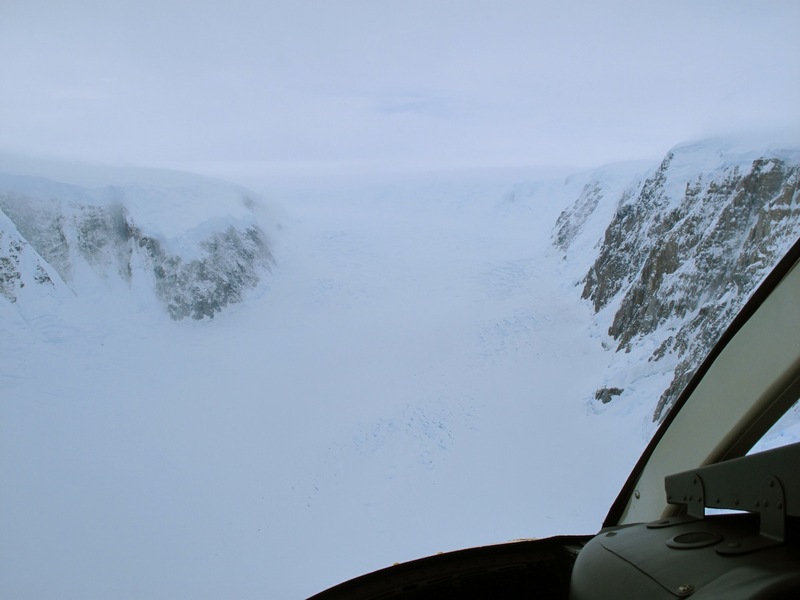 We took off at 9:48 this morning, and headed north to peer into the glacier troughs for some kind of path with thinner clouds overhead and less mist and blowing snow below. En route, our pilot (Barry James) wisely steered around a magnificent spire of rock looming like our own Matterhorn over the bay. “It doesn’t look at all like the Matterhorn,” mutters Martin Truffer. And with his Swiss accent, who can argue with him? We climbed the most promising trough in the ice, but as the ice rose towards the Antarctic Peninsula ridge-crest, the fog and clouds seemed to meet — no go for the east side today. 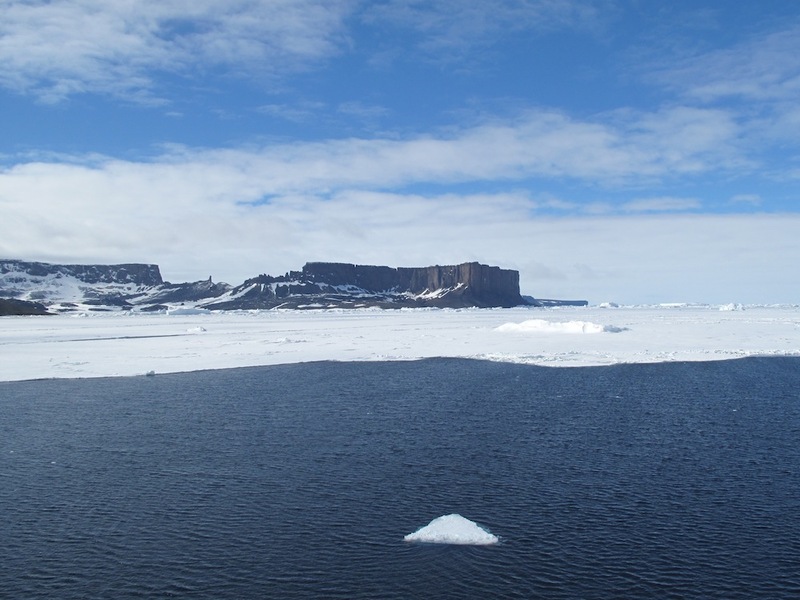 We turned to go back to the Palmer, and as we approached we had an excellent view of this ice-rimmed bay, and a look at just how tiny our floating village (the Palmer) is at the Antarctic scale. Erin and Terry were there to greet us after our thirty-minute flight. Spirits are still high, and we expect a better break on the weather tomorrow. 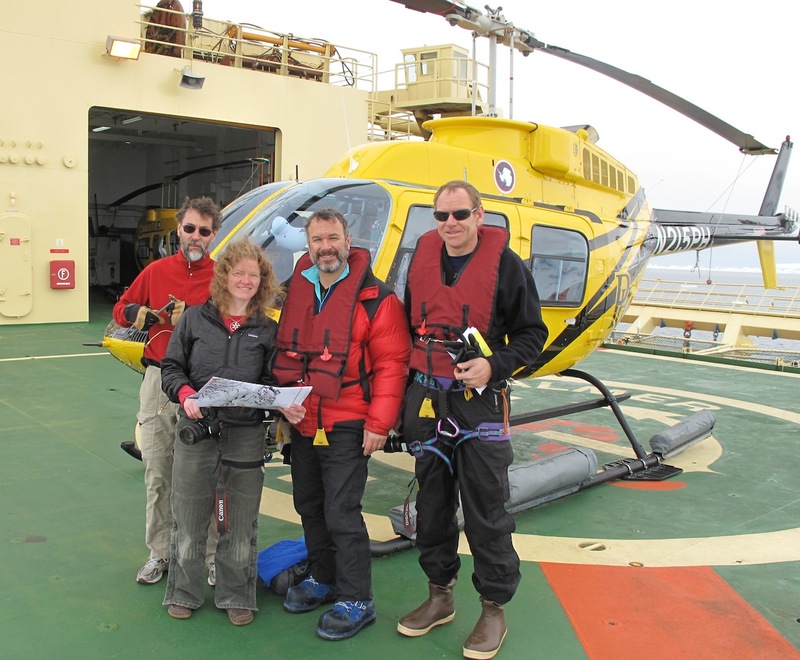 The LARISSA team poses in front of the helo, prior to another attempt at flying to the east side of the Antarctic Peninsula. From left: Terry Haran, Erin Pettit, Ted Scambos, and Martin Truffer. Once the team reached the ridge, fog and clouds forced them to turn around. The NB Palmer waits patiently for clear weather. 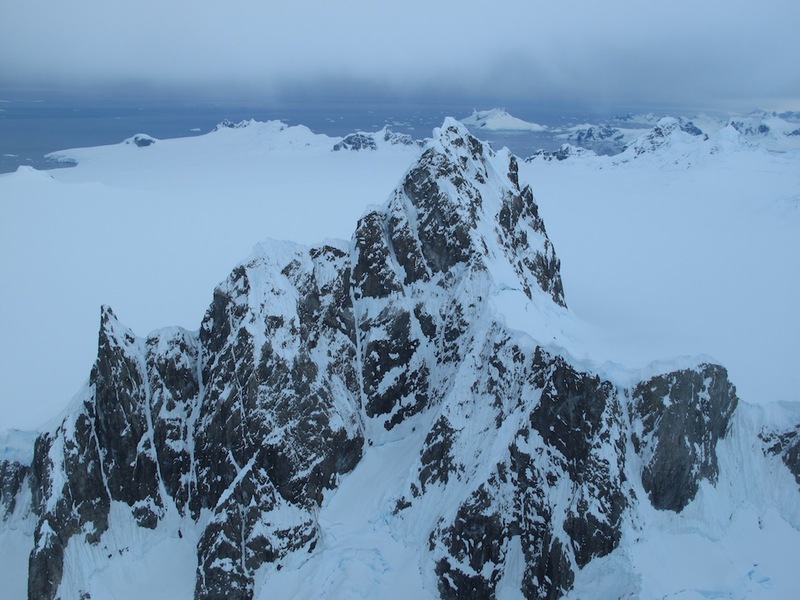 Ted Scambos thinks this rock spire, on the Antarctic Peninsula, looks like the Matterhorn. Martin Truffer disagrees. This map shows the location of Ted and Martin’s goal landing site near Barilari Bay. 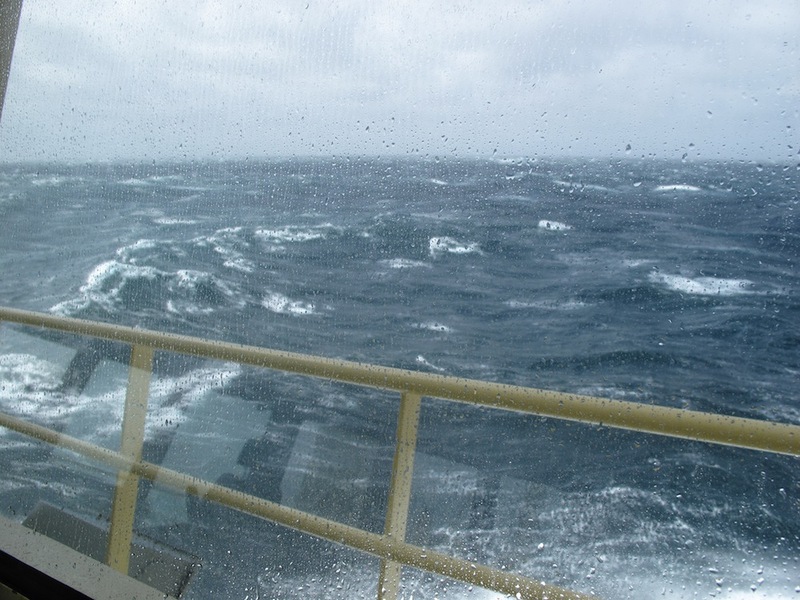 Stormy weather in Drake Passage made everyone sea sick. Much has happened since our last entry; the rough Drake Passage took a day from everyone. 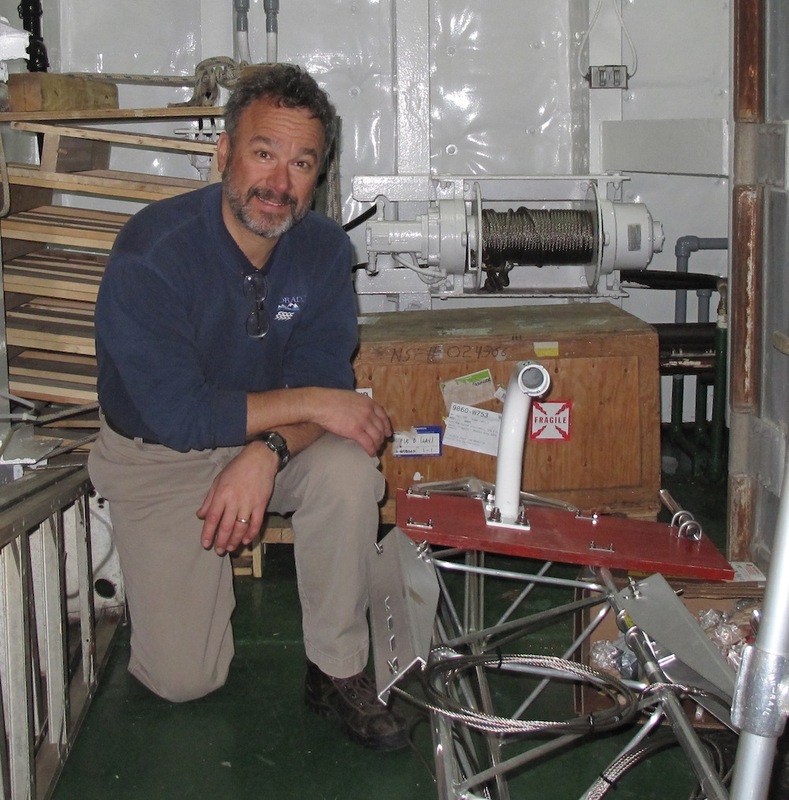 We spent the following days, with calmer seas but grey skies, preparing and testing equipment on the ship. 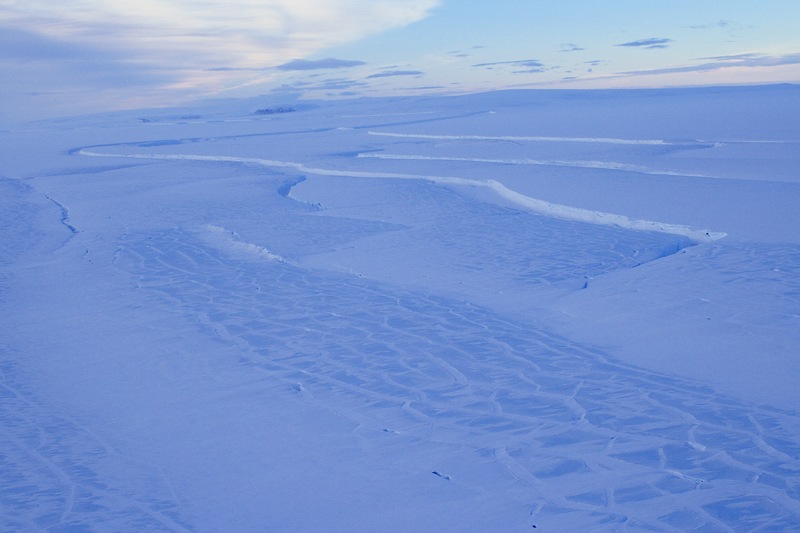 Our first attempt to reach the Larsen B Embayment area was blocked by thick rounded floes on the southeast side of the large James Ross Island, which sits like a small white pea under the bony fingertip of the Peninsula. So we took a chance on the Prince Gustav Channel, to the west, between James Ross Island and the main Peninsula. This passage was filled by impenetrable ice shelf until 1995; and so what we were attempting would have been impossible just 15 years ago. But in this year, a solid sheet of landfast sea ice filled the channel from coast to coast, with no breaks or floes. 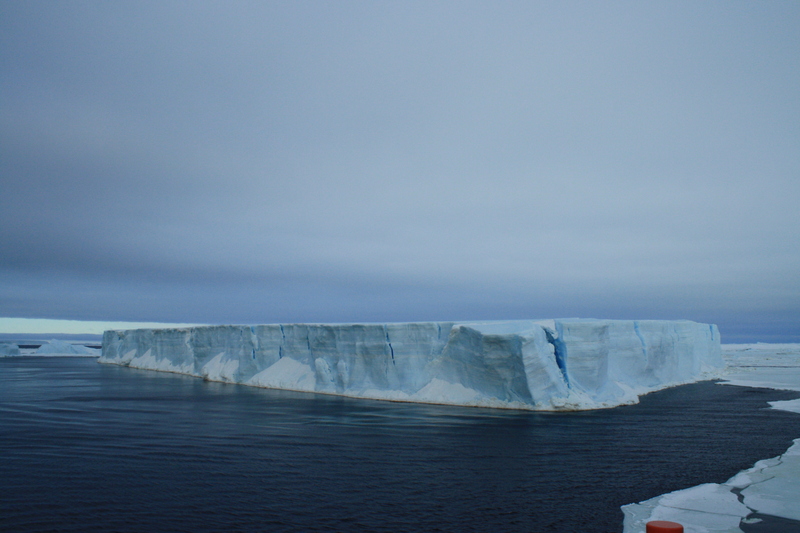 The hope was that this ice would snap neatly under the cutting prow of the ship. It looked good at first, with open water in the north, but near the 64 degree S line we saw a thin white sheet laying across our path. The ship plowed through it like butter, at first. But as we approached the mouths of two large glaciers, we were stopped again. Chunks of glacier ice from last summer had drifted into the channel, and were trapped by the ice, congealed into very thick fast ice and hard blue glacial blocks. The Palmer might still have crossed the frozen obstacle course, but at the risk of being in a position where forward was the only option. After crossing the Drake Passage, the Palmer found itself in a magnificent landscape. We decided late Sunday afternoon to conduct a day of science on Monday. We activated the helocopters, gave the pilots some practice as well as the science teams. One group visited rock outcrops to the west; the glacier team (Erin Pettit and Martin Truffer) went to the large glacier on James Ross Island. 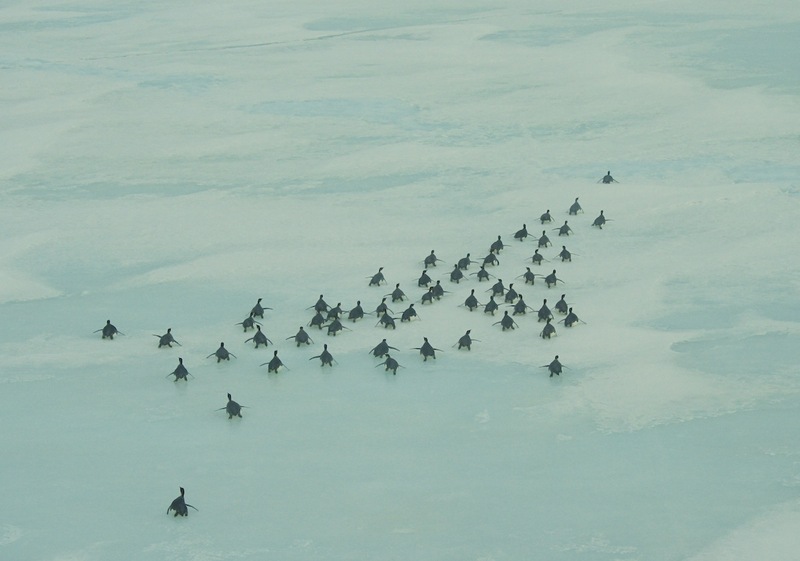 Other groups collected ice and water samples, and a separate helo flight scouted the sea ice route to the south. 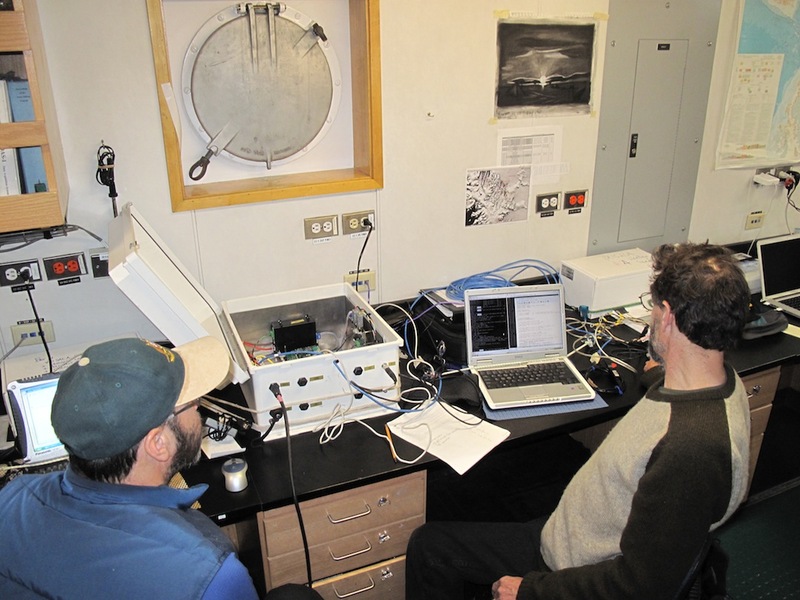 On the ship, the AMIGOS team (Terry Haran, Ronald Ross, and Ted Scambos) readied the first AMIGOS ‘skeletons’ and tested their instruments and some new software. 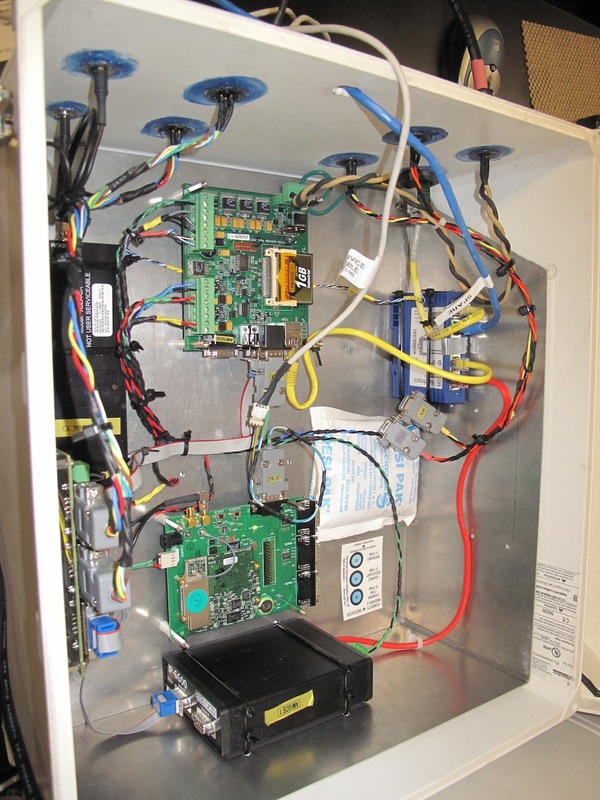 We have five instruments on these systems: a camera, a weather station, a sun sensor, a thermistor string, and a GPS; more on these and the science objectives behind them later. Sunday night, with clear calm weather and a near-midnight sun, the light and sky were extraordinary. 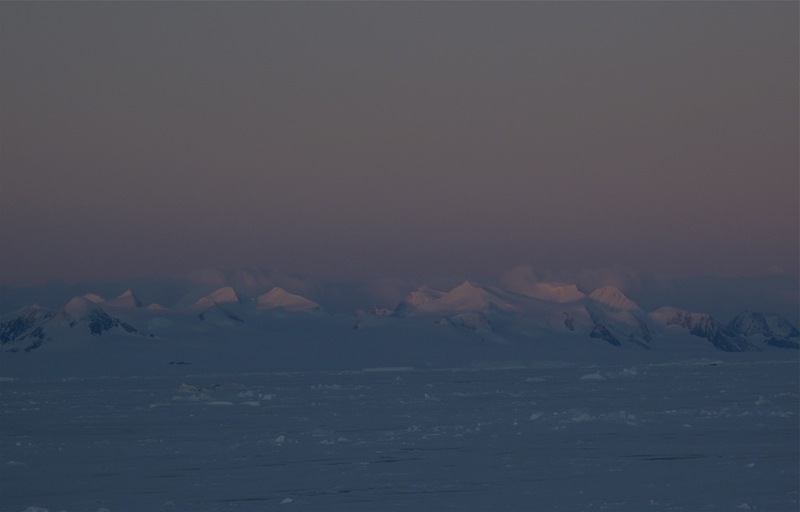 Brooding mountains, a firey sunset, and an ethereal moonrise behind the ice amazed everyone. There was a quiet reverence on the ship: it was truly awesome. The moon rises over the ice. This evening (Monday) we are now embarked on an even greater gamble than before; we believe the ice is impassable ahead, but melting; an so we are going to the west side of the Peninsula for perhaps three weeks to try to do some work and wait for conditions here to improve. The west side is currently completely sea ice free, and we will try to conduct some of the science by using the helicopters to fly over the ridge of the Peninsula to the east side. The gamble is that the weather is rarely good on both sides of the ridge at once. But the AMIGOS and ice team is ready to give it a shot. We will be in place on the west side by Thursday morning. Terry and Ronald work on the AMIGOS stations on the Palmer. Ted tests instruments on the AMIGOS stations. Sunday night brought clear weather and a tremendous view. 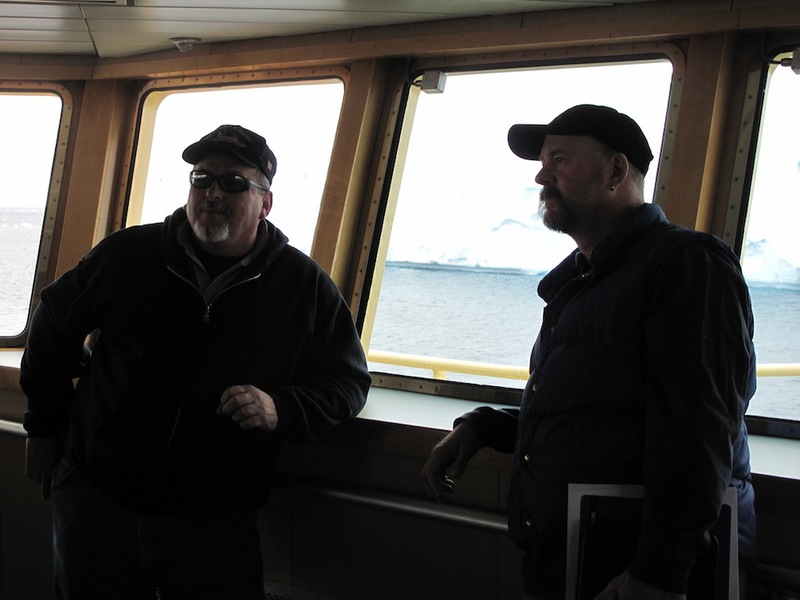 Captain Joe Borkowski (left) and Pilot Chris Dean discuss whether to push on through the icey passage. Sunday’s firey sunset amazed everyone on the ship. The Palmer slipped the surly bonds of the Punta Arenas pier at 5:20 p.m. yesterday, in a beautiful evening sun. The gear was stowed, labs secured, and a full compliment of staff and scientists were aboard. The temperature was about 62 degrees F, and there was a 15-knot breeze. We ate dinner at 6, and after a day of rushing to do the final shopping and securing, the adventurers relaxed, talked with energetic anticipation of the plans ahead and the past cruises that they’d enjoyed. The AMIGOS crew–Ted, Terry, Ronald, Erin, and Martin–were continuing to build the system software, especially for the new GPS boards, and improve the radar acquisition and analysis software as well. I downloaded our image collection for the survey regions and re-evaluated our selected sites with respect to crevasses, using MODIS, Landsat-7, ASTER, Formosat-2, and other data. Some early adjustments to the plans included adding a reconnaissance flight to evaluate as many of the sites as possible prior to any deployment of GPS or AMIGOS. We’re planning a loop flight across the Crane and Flask Glaciers, to literally see the lay of the land and the potential risks. 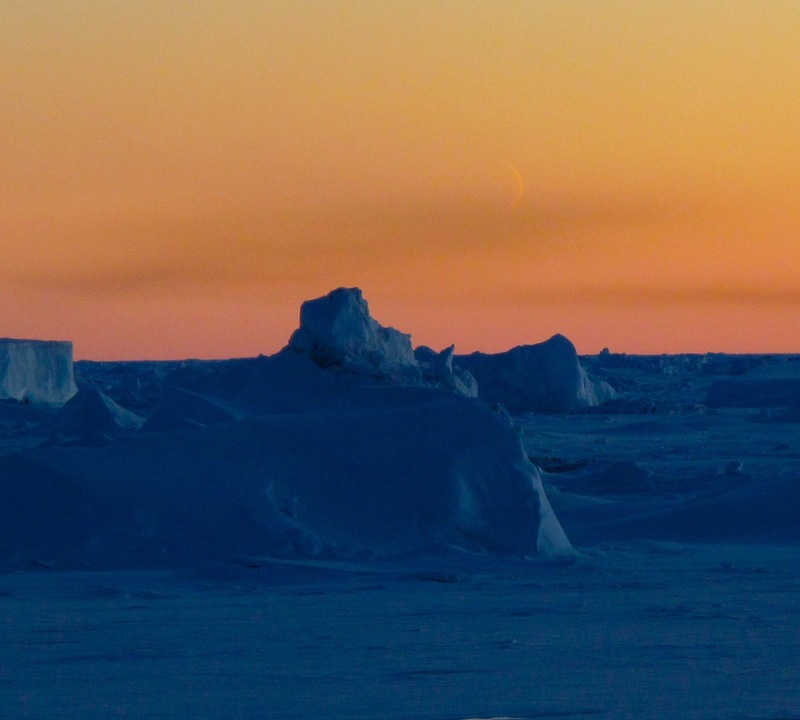 Current heavy sea ice conditions in the western Weddell Sea mean that other science operations may be delayed or progress more slowly than planned, so the AMIGOS team may see a lot of action in the early part of the cruise. We are planning to install three to four sites between January 10th and 20th. The sun set off the stern starboard bow. The Palmer is sailing east and north, towards the Atlantic, before a hard starboard turn towards the Drake Passage. You are currently browsing the archives for the Research Cruise category.